(Nanowerk Spotlight) Looking at Nature as a successful design lab with millions of years of research experience, it is quite surprising that scientists haven't tried harder to copy some of Nature's more successful and impressive design blueprint. The list of actual commercialized biodesign-inspired products is very short. The most famous is Velcro, the hook-loop fastener that was invented in 1945 by Swiss engineer, George de Mestral. The idea came to him after he took a close look at the burrs (seeds) of burdock which kept sticking to his clothes and his dog's fur on their daily summer walks in the Alps. He examined their condition and saw the possibility of binding two materials reversibly in a simple fashion. And then, of course, there are the Wright Brothers, who modeled their planes on the structure of bird wings. Today, there are quite a number of terms such as bionics, biomimetics, biognosis, biomimicry, or even 'bionical creativity engineering' that refer to more or less the same thing: the application of methods and systems found in Nature to the study and design of engineering systems and modern technology. The use of design concepts adapted from Nature is a promising new route to the development of advanced materials and increasingly nanotechnology researchers find nanostructures a useful inspiration for overcoming their design and fabrication challenges. Because biological structures are the result of hundreds of thousands of years of evolution, their designs possess many unique merits that would be difficult to achieve by a complete artificial simulation. However, utilizing them as biotemplates and converting them to inorganic material could be a highly reproducible and low-cost process for fabricating complex nanostructures with unique functions. Complex functional systems are still out of reach but the replication of biological structures is making good progress. A recent example is the fabrication of antireflection nanostructures by replicating fly eyes. We have written a number of Nanowerk Spotlights on this fascinating topic of nanotechnologists playing catch-up with nature: "Nature's bottom-up nanofabrication of armor", "Nanotechnology inspired by mussels and seashells" or "Algae shells: one example how nanotechnology is trying to copy Mother Nature", or "Unlocking nature's protein material concepts enables tomorrow's nanotechnology materials and cures", to name just a few. Insects have a lot of unique capabilities. A number of nanotechnology researchers are trying to duplicate these natural structures in order to achieve superior and unusual functionalities in man-made materials and devices. The biotemplated fabrication of natural biological structures is an approach for receiving unique nanostructures that cannot be made using conventional nanofabrication techniques, such as lithography. Dr. Zhong Lin Wang, Regents' Professor, COE Distinguished Professor, and Director, Center for Nanostructure Characterization, at Georgia Tech, already has experience with bioinspired fabrication. We have covered his work in our Spotlight series before, most recently with a report on a direct-current nanogenerator that is driven by ultrasonic waves (Nanoscale power plants). In 2006, Wang and his group replicated butterfly wings ("Controlled Replication of Butterfly Wings for Achieving Tunable Photonic Properties"). Now, Wang's lab has examined the fine structure of the compound eyes of a household fly and precisely replicated its entire structure using a low-temperature atomic layer deposition technique. The results have been published in the December 6, 2007 online edition of Nanotechnology ("Bio-inspired fabrication of antireflection nanostructures by replicating fly eyes"). "Our contribution is the ability to replicate a biological structure and then measure its physical properties and find out why a particular structure exhibits unusual properties" Wang explains to Nanowerk. "By doing so, we are trying to find an effective fabrication path that follows the evolution of Nature for making extraordinary nanostructures." "The surface of the fly eye is covered by highly packed protuberances, which potentially increases visual efficiency through increased photon capture for a given stimulus" Wang comments on his group's most recent bioinspired nano research. "We carefully examined the fine structure of the household fly compound eye and then completely replicated the entire configuration by alumina through a low-temperature atomic layer deposition process." 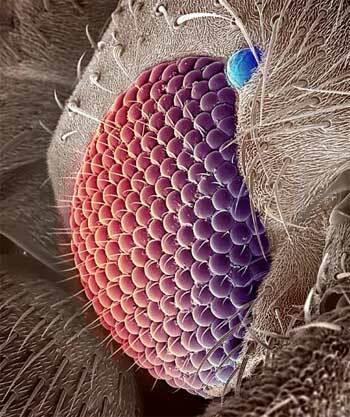 Insects have compound eyes – instead of one lens they see through a sphere with many hundreds or thousands of eyes, so called ommatidiums. Household flies, for instance, have a very well-developed visual system with the capacity of seeing motion, color and pattern of objects in their environment due to their advanced compound eyes. The Georgia Tech scientists' goal has been focused on the optical properties of the fly eye's nanostructure, aiming to understand the visible light, UV light and infrared light transmission through the structures. "We achieved the alumina replica by removing the fly compound eye template at high temperature, and the alumina coating was crystallized simultaneously" Wang describes the experimental details. "The success of our replication was not only with the morphologies but also with the optical features – the unique antireflection property of the eye was also inherited by the alumina replica. By measuring the reflective spectra of the replica, we demonstrated that the alumina replica of a fly eye was an efficient antireflection structure of visible light at an incident angle up to 80°." Wang says that the fly eye replica with antireflection structure exhibits great potential in the applications of optical coating, sensing or lens arrays. His group is now working on developing more sophisticated replication techniques for tuning the optical response of the structure in order to optimize the performance.